CSU’s latest $11.2 million renovation project—The Foundry—is capitalizing on the food hall trend. At the beginning of the fall semester, Colorado State University (Fort Collins, Colo.) unveiled the crown jewel of its decadeslong dining improvement program, The Foundry, which features video menu boards, a large community kitchen and eight distinct micro restaurants each with different themes, menus and seating areas. 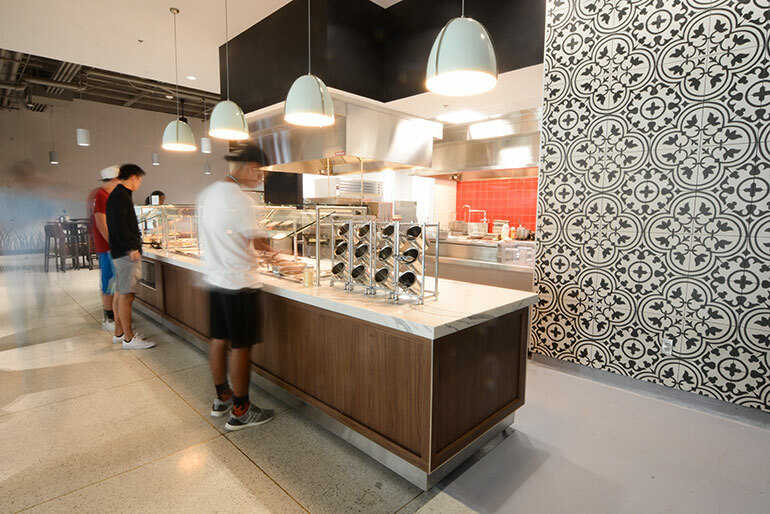 Inspired by big-city food halls, The Foundry is located in the old cafeterias at Corbett and Parmelee residence halls. The two halls have always had a connected kitchen with a shared dish return area for years, but the recent $11.2 million renovation project merged and upgraded the facilities. Theory: This concept is housed in a shipping container and features a food truck-themed menu that rotates weekly, offering fast-casual dining in the form of small plates. Passport: Featuring cuisines from around the world with loads of customizable options, this concept serves everything from bibimbap and sushi bowls to custom-made fresh arepas. Its overall look resembles an airport terminal, and showcases food from areas like the Pacific Rim, Indian Overland and Caribbean islands. 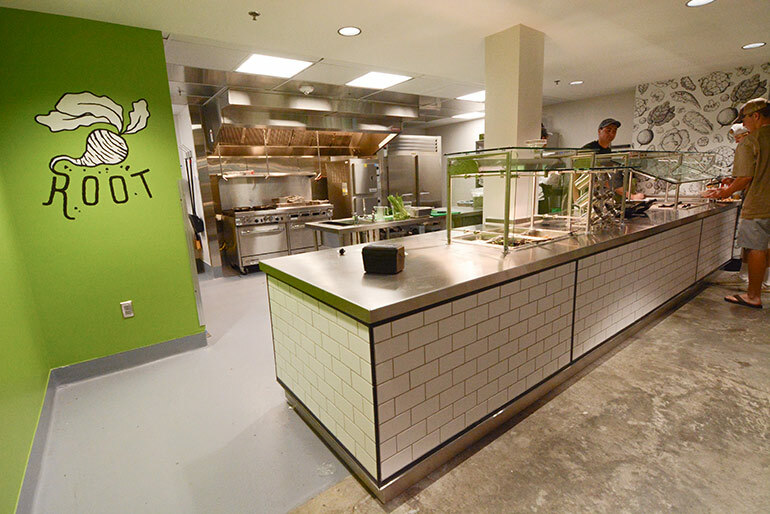 Root: This micro restaurant features a plant-forward menu concept with built-to-order grain bowls that pair lean proteins, whole grains, sauces and toppings, as well as greens grown on campus. 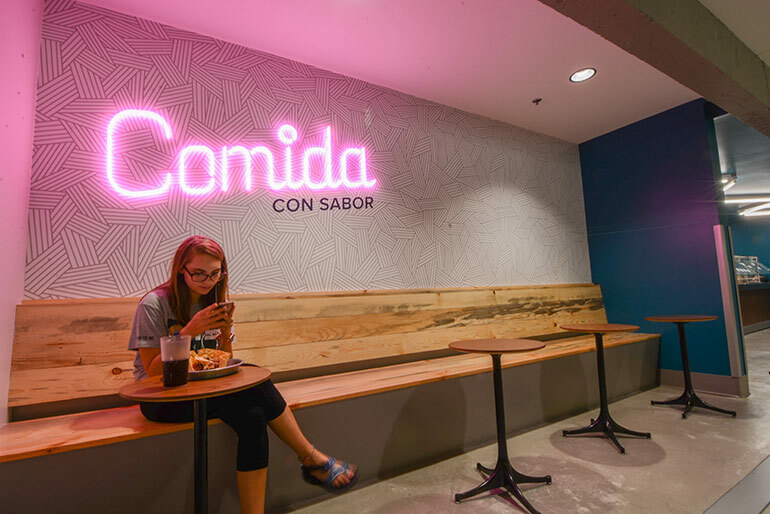 Comida con Sabor is a fresh-Mex concept where patrons can build their own quesadilla, burrito, taco or nachos with a wide variety of meats, vegetables and cheeses, then top it off with freshly made house-roasted salsa. Piatto: Guests can design their own pasta bowl with a huge selection of meat, vegetable and cheese toppings, or enjoy freshly made pizzas and breadsticks. 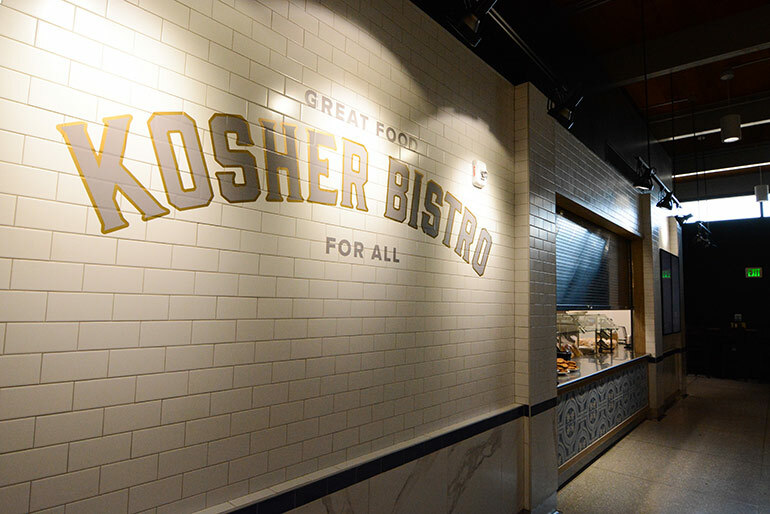 The Kosher Bistro, Northern Colorado’s only certified kosher eatery, serves certified kosher foods and is designed like a New York deli. Creamery: Dessert concept with a variety of pastries and locally made ice creams. 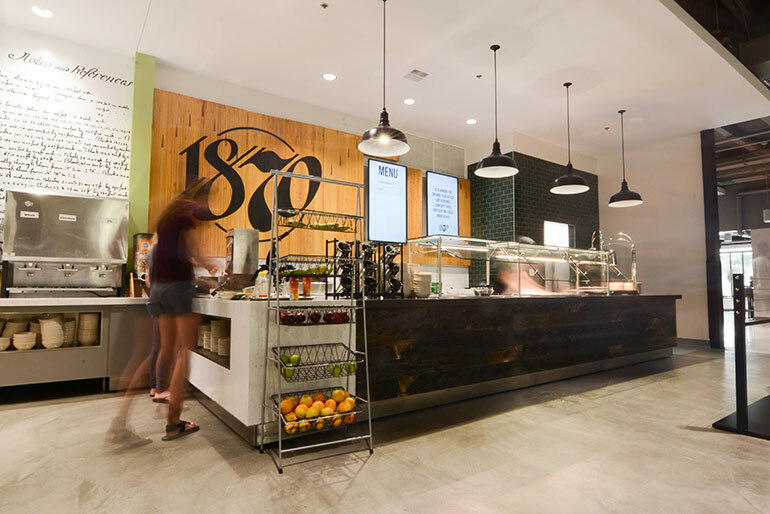 1870: Rotating comfort foods at a place named after the year CSU was founded and decorated with an 1870 map of Fort Collins. The dining hall is still all-you-care-to-eat, allowing students to mix and match items from the different micro restaurants. “We’re seeing well over 3,000 patrons a day here,” says Jason Scott, project and programs manager, adding that the location of The Foundry is near CSU’s largest resident population. The timeline for the renovation was aggressive, but the work was completed in only about four months during the end of spring semester and into the summer. It also included a private dining room, Pawnee Grassland, that can be reserved for groups up to 40 people and features pictures from local photographers of the namesake grassland, which is about 35 miles east of Fort Collins. The Foundry represents the final phase in a series of improvements CSU has made over the past decade to its dining facilities. In fact, CSU has invested about $35 million into overhauling its dining halls in the past dozen years.